The Odor Containment Bag is the most effective odor eliminating carrying case on the market today. Made out of military grade, activated charcoal-infused cloth, the OCB filters the scents and smells of the bag's contents, leaving you and your things odor free. Worried about spilling or slippage? Equipped with two industrial strength velcro seals, the OCB calms any of those concerns, while remaining easily accessible to the user. 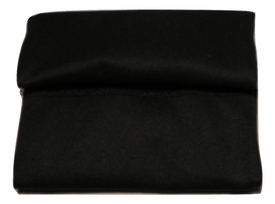 Available in multiple sizes, all in black, the OCB is both practical and inconspicuous. If you've ever had fresh and strong smelling herbs or teas, and been left with an embarrassing odor emanating from your pocket or handbag, the OCB will be your ultimate peace of mind. Want to hide the dog treats from your overly curious pup? The OCB has been proven effective when tested with multiple, specially trained canines, so Fido definitely won't be finding them! Strong odor emitting medicines or health supplements contaminating the change of clothes in your backpack? Not a problem, just put it in a plastic bag, and into the OCB, and goodbye odor! Perfect for close quarters like a subway car, taxi, bus, or elevators, avoid attracting unwanted attention from others by never leaving home without your OCB. Easily hand-washable, reusable, and most importantly effective, the OCB will have you wondering why it took you so long to get one in the first place! *Disclaimer: Flat-D Innovations is not responsible for anyone using this product to engage in illegal activities. * Purchase the OCB at your own risk. ***All experiments involving the canines were conducted in a sterile and controlled environments.